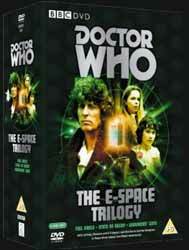 Doctor Who: E-Space Trilogy includes the stories Full Circle, State of Decay and Warriors Gate. The trilogy would see the departure of Lalla Ward as Romana and the introduction of Matthew Waterhouse as the ever popular Adric. The set is presented over three packed discs overflowing with oodles of extras, some great, some iffy, but at this rate Doctor Who may well end up as the best documented show ever. Full Circle was written by Andrew Smith and directed by Peter Grimwade, the show originally aired between 25 October 1980 and 15 November 1980. The four episode story sets up the premise that the TARDIS has slipped out of normal space into a much smaller universe called E-Space, with the scanners blinded the Doctor and Romana land, thinking that they have reach Gallifrey. They are in fact on the planet Alzarius, where a crashed space liner's crew seem to be engaged in permanent preparations to leave, endless preparations which has caused a generational divide, with some of the crew's children rebelling. The Alzariuns are not the only life that exists and when Mistfall starts the Marshmen rise out of the marshes. Adric, a native of the ship tries to join his brother in rebellion, but when Mistfall starts, his life is imperilled and he takes refuge in the TARDIS. For the few who were unaware the show had the distinction of having been written by a fan, the first time that such a script had been commissioned. Overall it’s a good tale, for a writer who was obviously steeped in Who knowledge. Tom Baker is, as always brilliant and Lalla Ward gets to do more than just be a foil for the Doctor. One of the funniest things about the disc is that the scene which accompanies the menu gives away the central secret of the story, oops. Special effects on the show range from quite good, especially the Marshmen coming out of the water, to the downright awful, the dreadfully unconvincing spiders which bite Romana. At this point it is traditional to embark on an unnecessary diatribe about the lack of Matthew Waterhouse’s acting ability, his inclusion for some strange reason always splits fans of the show. Okay, he’s not the greatest actor in the world, but he auditioned for the role just like anybody else did and lets not forget that his character was to be akin to the artful dodger, a fact that all of his directors seemed to forget. So a young, and inexperienced, actor did the best he could, which most probably accounts for why the character never really progressed. As ever Auntie Beeb has thrown together a fairly decent set of extras, including a full length audio commentary by Matthew Waterhouse, Andrew Smith and script editor Christopher H Bidmead as well as the traditional information text. Should you so desire you can also listen to the isolated music score, not sure why as it appeared in so many BBC shows, which all starts to sound the same after a while. All Aboard The Starliner is a Making of... feature, which includes contributions from Andrew Smith who was still in his teens when he was commissioned to write the script. K9 in E Space is a look at how the powers that be combined to get rid of K9, his only defender in this regard appears to be Lalla Ward. There is an old piece from Swap Shop with Matthew Waterhouse and a rather odd E-Space Fact or Fiction segment, which looks at the probability of such a place existing. Rounding things up are the continuity announcements, a photo gallery, Radio Times Listings and trailer for the future release of The Romans and The Rescue. The second story in the trilogy, State of Decay, was written by Terrance Dicks and directed by Peter Moffatt. The four-part story originally aired between 22 November 1980 and 13 December 1980. Not for the first time has Doctor Who plunder other stories or genres and in State of Decay we are slap bang in vampire territory. The Doctor, Romanna, K9 and Adric arrive on a planet that looks like it is still in its middle ages, The villagers are ruled over by three great lords: Zargo, Camilla and Aukon and while the villagers fear ‘the wasting’ their masters are planning the resurrection of a Great Vampire - a race known and feared by the Timelords. If anything the production values on the show look even better than the first story, the sets creating a palpable level of gothic claustrophobia. The guest stars do a fine job, but the show is stolen by Emrys James who plays the real power behind the throne, Aukon, leaving little for Rachel Davies (Camilla) and William Lindsay (Zargo) to do apart from strutting their stuff hissing and engaging in petty asides. One of the fun things about the show is trying to work out the denouement, after all a vampire story would not be acceptable without the obligatory stake in the heart scene. Once more there is an interesting commentary track with Peter Moffatt, Matthew Waterhouse and Terrence Dicks as well as the option for the info text. The Vampire Lovers is a documentary looking at the near still birth of this story, its resurrection and how it finally appeared on the screen. Film Trims does what it says on the box, being footage which was finally cut from the aired show. Leaves of Blood is a look at the wider world of vampire fiction and lore, presented by Nicholas Briggs. The Blood Show takes an odd look at all things blood. The Frayling Reading has Christopher Frayling, cultural historian, taking a historical look at the role of vampirism. Just like the first disc the second is rounded out with the continuity links, a photo gallery, the Radio Times Listings and a trailer for the next DVD. Last, but by no means least is Warriors Gate, written by Steve Gallagher and directed by Paul Joyce. The four-part show originally aired between 3 January 1981 and 24 January 1981. Not for the first time, the TARDIS is hijacked, this time by a Tharil named Biroc, a race of lionesque creatures who have the ability to navigate time and space. He brings the TARDIS to a void whose only other inhabitants are the crew and cargo of a slaver ship, the only other structure in this void is the Warriors Gate, a trans-dimensional portal. Biroc wants to free his people, who are now in servitude to the humans, though once they were the human’s cruel masters. Warriors Gate, with its minimalist environment, was a brave experiment by the production team. The show is also notable as both K9 and Romanna leave the Doctor's side. Whereas previous shows had made sure that the audience had all the facts at their fingertips, Warriors Gate preferred to remain substantially an enigma. Many parts of the plot and back story remained a closed door. In many respect this makes the story the best of the trilogy. Like the previous two discs we have a full length feature commentary, the isolated score and the additional text information. The extras include The Dreaming, a documentary about the making of the show; The Boy with the Golden Star is a small piece about Matthew Waterhouse; and Lalla’s Wardrobe - no stretch of imagination what that one is about - is a nice insight into costume design. The second set of extras has some extended and deleted scenes, the usual continuity, photo gallery, Radio Times Listings and a trailer for the next DVD. Overall, given the strength of the stories, the general quality of the acting and production, this set should find a home with any fan of old Who.